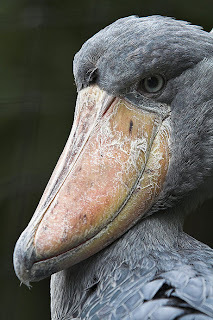 I've long been a fan of the Shoebill. They just look so... dangerous. I'm a huge fan of dangerous things that can't hurt me in any way. In fact, that's my favourite kind of dangerous! 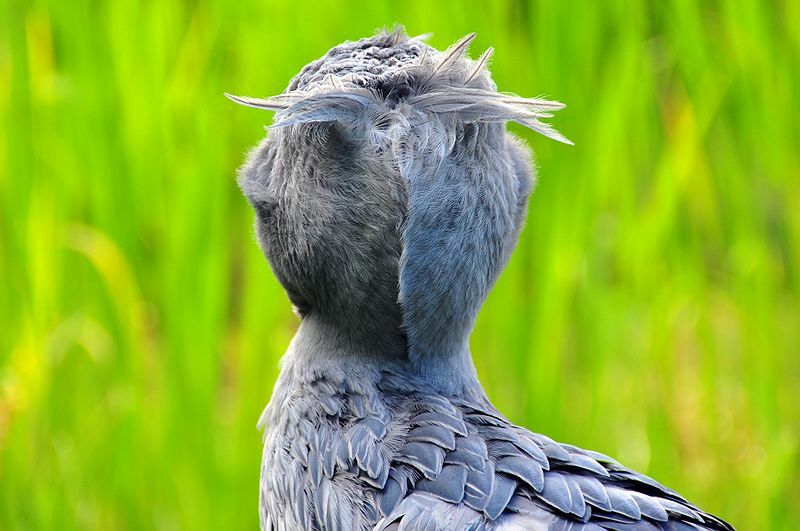 Shoebill's quite clearly get their name from the massive, shoe shaped beak sticking out of their face. The thing is huge and incredibly menacing! Long, broad and deep, with a nasty hook at the end so you really get the point. It reaches about 10 cm (4 in) across and 23 cm (9 in) long. Some say it's more like 30 cm (12 in), which would be very pleasing since that'd be a foot! 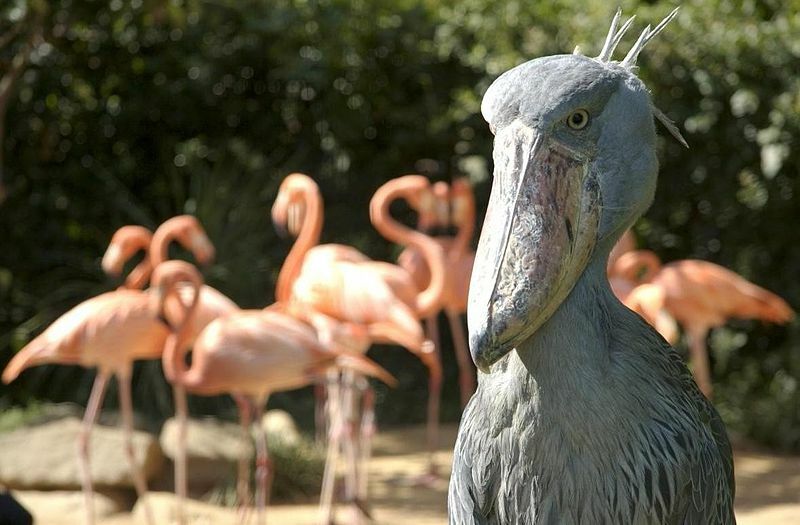 I'm sure you've figured out that the Shoebill ain't one for salad. They prey on fish, frogs, rodents and, as if investing for the future, reptiles like baby crocodiles. 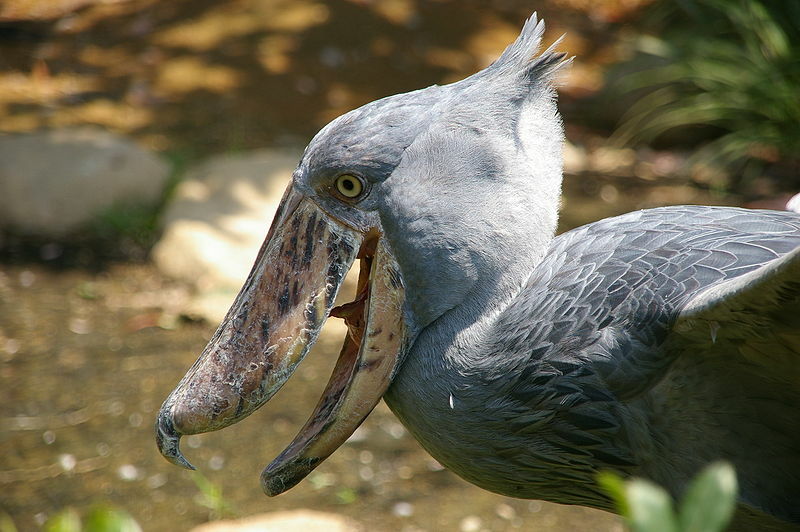 This occurs in the east African swamps and marshes they call home. They are particularly fond of the ones with papyrus. There are a few other things that fascinate me about the Shoebill. One that I just noticed is that their grey feathers make them look like a statue. Another is that look in their eyes. Sometimes they seem malevolent, sometimes incredibly grumpy, other times they look bright and enthusiastic. I love this picture! Monsters rule, front and off-centre! I always thought they looked kind of guilty, with their chin pressed into their chest like that. Haha! With that in mind they look kinda cute!